I love World Book Day! I think anything that gets people excited about books is a good thing, and I really enjoy seeing all the different ways to celebrate books out there. I especially love it when people dress up as characters from my books! So here are some amazing tweets I've seen this year, with a huge THANK YOU to all the readers, parents, teachers and schools who've been part of it! I'd like to say a very big THANK YOU to Sophie Jacques and everyone I met at Radcliffe Primary School when I visited them last week! I'd like to say an especially big thank you for their amazing PHOENIX STEP (above)! 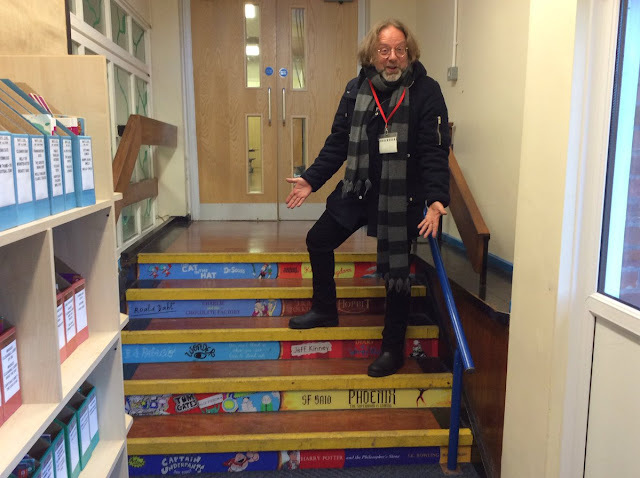 I've never had a step before, and was totally blown away to see Phoenix there, along with Harry Potter, The Cat In The Hat, and many more of my own favourite books. What a brilliant way to celebrate reading – I wish we'd had steps like this when I was at school! 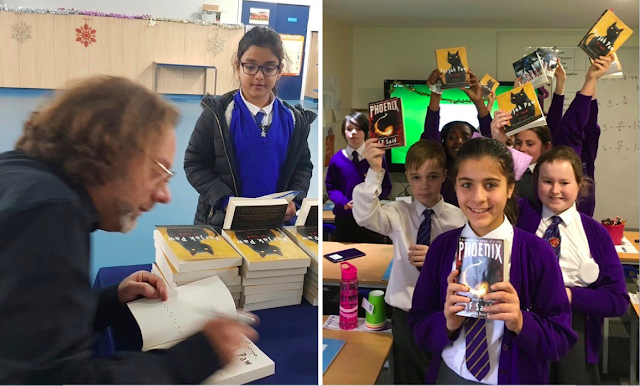 Radcliffe is a school where they've been reading both Phoenix and Varjak Paw, so it was a real pleasure to talk to Years 6, 5, 4 and 3 about writing and books. There were many terrific questions – more than we had time to answer. So if anyone from Radcliffe would like to ask me another question, or to say anything about the visit or my books, just leave me a comment below! 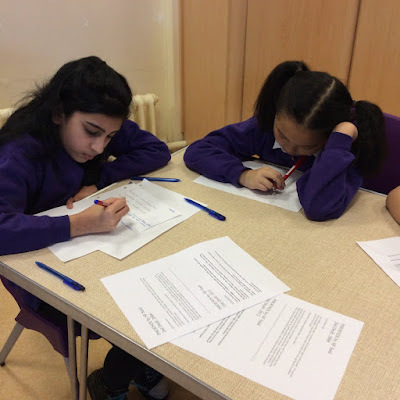 It was then inspiring to do a creative writing workshop with some Year 6 & 5 students. 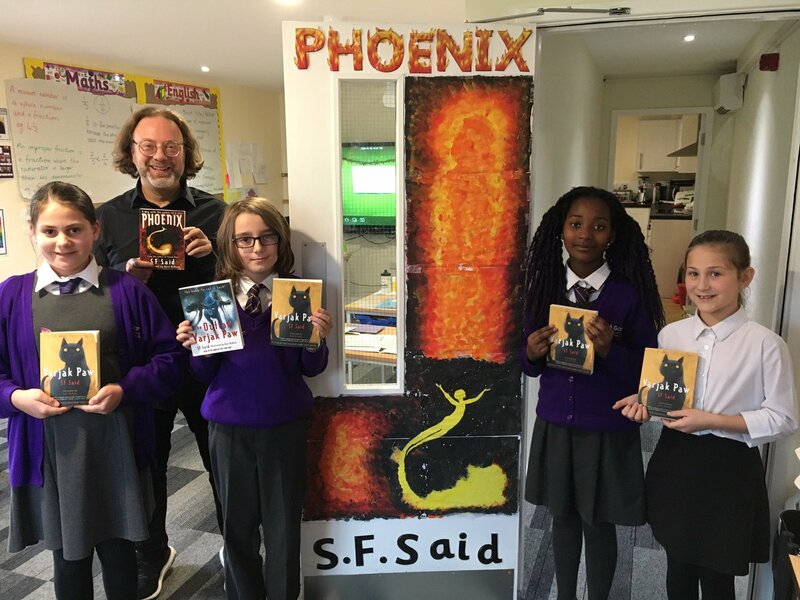 They were full of brilliant ideas, and in just an hour, they produced such original, entertaining and well-written stories – this is clearly a school with great writers as well as readers! Finally, it was a pleasure at the end of the day to sign books for everyone who wanted them. But if anyone missed out on getting a signed book, and would like one now, you can order them from the brilliant Pea Green Boat Books, who did a fantastic job on the day. Thanks again to them, and to everyone who made this such a memorable visit! 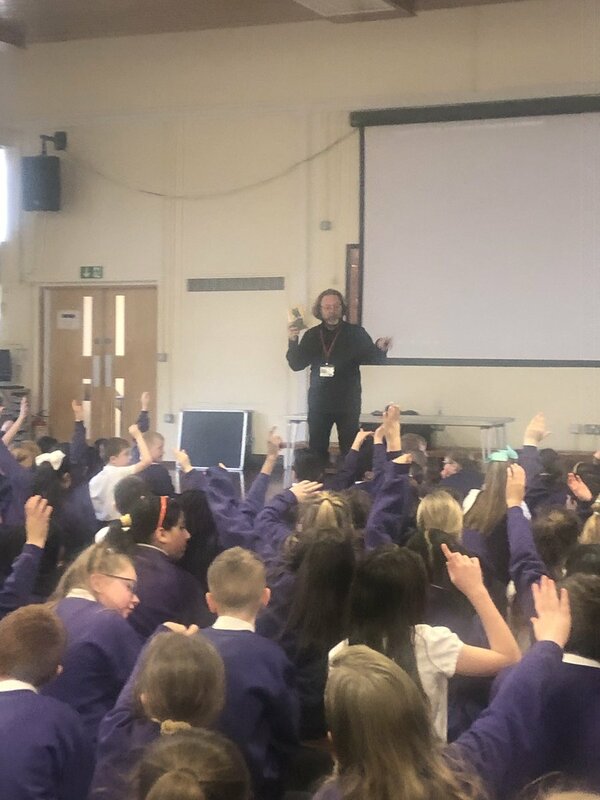 I'd like to say a massive THANK YOU to Mr Booth, Miss Wardle, Miss Flynn, Mr Power, Miss Wells, and all the wonderful students and staff I met when I visited Garston & St Silas Primary Schools yesterday! I first met Mr Booth 4 years ago, when I visited another school where he was teaching at the time. We've kept in touch through Twitter, and I was delighted when he invited me to visit St Silas, where he now works, as well as Garston, which is also part of the Rainbow Education Trust. The visit began at Garson, where I was honoured and amazed to see their sensational Phoenix door (see above)! 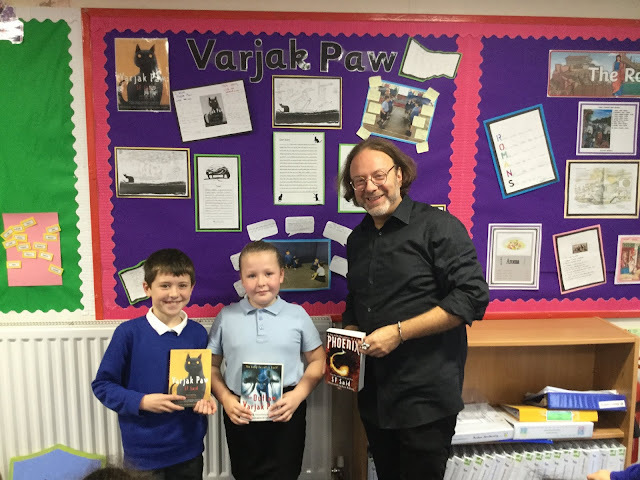 Year 6 at Garston were reading Phoenix, while Year 4 had been reading Varjak Paw, so they had many great questions for me. It was inspiring for me as an author to see so much enthusiasm for books; it was clear that this was a school that really valued and celebrated reading. Here's a wonderful blog about the visit on the Garston website, with many more pictures! After visiting Garson, I went on to St Silas, where I talked to Years 6, 5, 4 & 3 in an assembly. And it was immediately clear to me that this school valued and celebrated reading in just the same way. 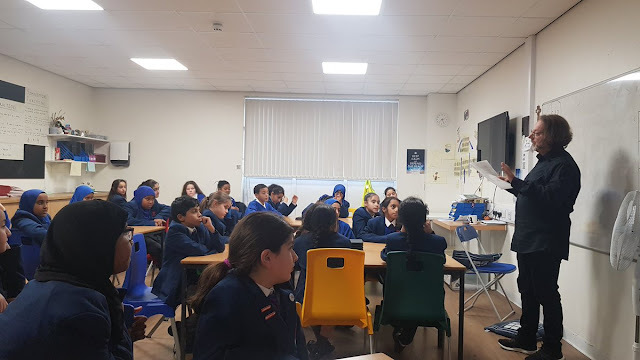 Many of the children at St Silas had read one of my books too, so they also had lots of great questions; more than we had time to answer! So if anyone from either school has more questions, or would like to say anything about the visit or my books, just leave me a comment below. After the assembly, I did a creative writing workshop with Year 6 – Mr Booth's class – with the help of Miss Wardle. I'd already heard about their work on Mr Booth's Twitter, so I knew they would be great readers and writers, but I was blown away by the quality, creativity and imagination of the stories they wrote. I hope I might able to feature one or two of them on this blog, so watch this space! And in the meantime – THANK YOU again to everyone who made this such an enjoyable visit! I'd like to say a big THANK YOU to Mike Johnson and all the students and staff I met at Butterstile Primary for a fantastic visit last week! 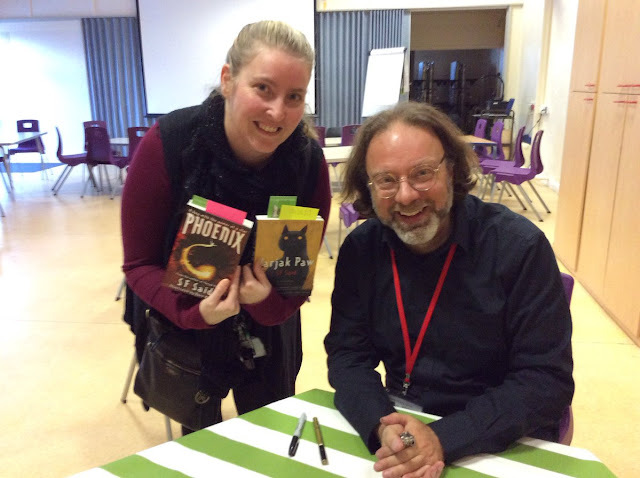 It was a pleasure to talk to Years 6, 5, 4 & 3 about writing and books. 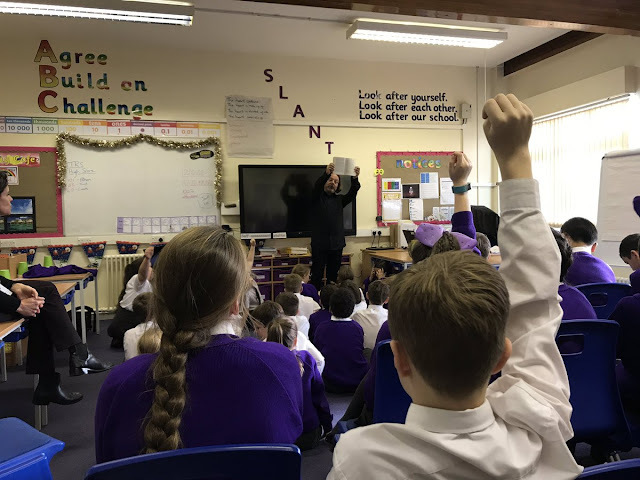 There are some fantastic readers at Butterstile, and there were many great questions – more than we had time to answer on the day. So if anyone would like to ask any more questions, just leave me a comment at the bottom of this page! It was then great to spend some time with Year 4, who have been reading Varjak Paw, and producing lots of brilliant work inspired by it. Here's a news report on the Vanishings and a retelling of the beginning of the story, written by Butterstile Year 4s! It was a pleasure at the end of the day to sign books for everyone who wanted one. I hope everyone is enjoying their books – so I'd like to end by wishing you all HAPPY READING! and HAPPY WRITING!